From what I can see far too many Scottish salmon fishing beat owners have not invested the required ongoing 'time & money' to keep abreast of the ever changing Google search engine criteria even if they have funded a basic internet website. Too many estates have thought that appointing one internet based agent was effective enough for ticking the box for optimising their salmon beat's vital internet presence but that assumption is indeed one of the nine tenths! One monopoly in any field of business breeds complacency and even the best fighters in the world have honed their skills with numerous sparring partners! To run successful 'Google visible' internet marketing websites is an ever ending marathon of daily effort and forward planning. As an example my main www.salmon-fishing-scotland.com website has had daily salmon fishing related content added for the last 2450 days without fail. Work that out in real money and you'll see it equates to a continual daily effort for 6.7 years! That consistent daily effort is a small part of the work involved in making sure a website gets noticed as the slickest site that isn't visible at or near the very top of Google searches is of little commercial value if attracting new clients is important to the business. Last week alone my trusted website 'Search Engine Optimisation' team were attending a Google run conference that was giving the 'heads up' on the latest Google website SEO recommendations so this internet game is truly ever changing as consumer internet browsing changes frequently. If you think you can simply build a website or revamp your website every decade you're truly kidding yourself on and those who trust in you to represent them 'optimally' on the world wide web. I've also discovered over the years that SEO is a 'unique' skill in itself and few website builders or designers fully understand or can successfully implement an effective SEO strategy in addition to building a website. A successful forward thinking SEO strategy is like giving a fast moving clay pigeon a bit of lead to stand half a chance of dusting it! Long gone are the days of having to call an office telephone number between the hours of 9am to 5pm through the week and gone are the days of A4 posters or glossy brochures. We are well and truly immersed in the new internet age and if you're not investing in this vital representation 'effectively' your business will suffer. As an example of this one of the River Tay beats this website represents sold £21k more than all other agents over the last 10 weeks and in the same time frame exceeded all agents sales input for the entire 2017 salmon fishing season! Here's the main difference; 95% of this activity was generated from international clientele via the world wide web and not from the 'catch statistics' trained home grown salmon angling brigade that now 'hold back' and seldom book their salmon fishing in advance. It's one thing to present a salmon beat correctly & visibly on the internet but the delivery of a salmon fishing experience is vital too. 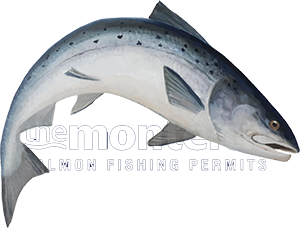 It's naive 'short term' mentality to have a client trusting you to then deliver a low grade experience whether it be a 'guided' salmon fishing day or a 'permit only' salmon fishing supply. The reality in Scottish salmon fishing is that there are loads of good salmon fishing venues and a few truly brilliant ones. I often think about the old days when you walked into the sports shop for a new pair of trainers and it was either the black or the white ones. These days you'll walk out of most sport shoes shops 'dizzy' and more often than not empty handed!